Today we are featuring projects by Tatiana and Amanda! 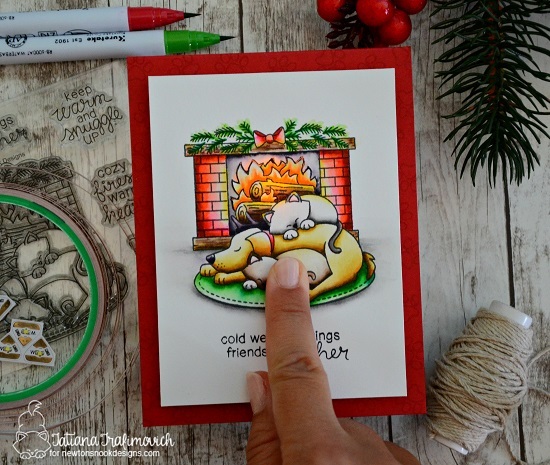 Tatiana used the Chibitronics Starter Kit along with the Fireside Friends Stamp Set. Don't you just want to cuddle right up with those cuties? She added some extra interest to her card by stamping the paw prints on the red cardstock for a tone on tone look! So pretty! And I love how she used the vellum behind the fire, too! When the fire lights up, it's just too adorable! The sentiment is also from the Fireside Friends Stamp Set! It really looks like the animals are lit and warm by the fire! Amazing coloring! This card by Amanda is such a hoot! She used the Chibitronics Starter Kit to create a light up card for Halloween! She created a awesome spooky background with distress inks to set the scene. She stamped and colored that cute owl from our from our What a Hoot Stamp Set, trimmed him out with the coordinating What a Hoot Die Set and added him onto her card with three pretty pumpkins! The pumpkins were stamped using our Pick-a-Pumpkin Stamp Set and cut out with the coordinating Pick-a-Pumpkin Die Set! Can you guess what lights up on this card? It's the owl's EYES! How spooky and cool! Check out Amanda's blog for more photos today! Awesome cards! I'm loving all the clever ideas for using the fun lights this week. Great cards and ideas. Loving all this inspiration. Wow! Love so much all the beautiful details of these fabulous cards!!! These are great cards for Chibi lights. Loving all the ideas. Both are so cute. I really like the fireplace lighting up. Beautiful and fun cards. Love the lighted fireplace, so cool. And I'm a birdie lover, so adore the owl! Both of these cards are so adorable! I would love to try one of these fun light kits! I love both cards! The designers have done an amazing job all week! I have thoroughly enjoyed the collaboration! Adorable cards, love the fireplace lighting up. Awesome cards today! I am enjoying this fun collaboration week! Such clever ideas for cards, these are so fun! Wow! That background on the Amanda's card is so incredible! I absolutely love her card!!! Lovely cards. I love the Friends in front of the fire stamp, it was one of my favorite already last year. With the lights, the card is even more adorable ! Absolutely too cute not to hoot! Great coloring and inspiration. Thank you. Some beautiful colouring on both of these cards and those friends in front of the fireplace are just adorable. Such a great idea to collaborate with each other! A warm fire and warm, glowing night make these outstanding! I really liked the fireplace stamp before, but I love it with the light inside. Great card!